With those 11 words, HBO’s true-crime docu-series The Jinx: The Life And Deaths Of Robert Durst cemented its spot among the most riveting television of 2015. Durst, the Manhattan real estate scion suspected of three murders and heretofore convicted of none, uttered the words into a live microphone after concluding an interview with documentarian Andrew Jarecki, who presented convincing evidence of Durst’s guilt. The unsettling comments make up the final moments of The Jinx, Jarecki’s meticulous and patiently researched six-part examination of Durst’s alleged crimes. The gobsmacking twist was made legendary by breaking news of Durst’s arrest in New Orleans the day prior to the finale’s airdate and his agreement to return to California to stand trial for murder. The Jinx’s finale sets a high-water mark for the increasingly prominent serialized murder-mystery, but it also threatens the subgenre by emphasizing the destination rather than the journey. In interviews prior to The Jinx’s premiere, Jarecki assured potential viewers the show would reach a firm conclusion about Durst’s guilt, a promise that seemed impossible to keep. But Jarecki was secretly armed with evidence too damning to explain away. Jarecki corners his subject with the handwritten envelope of a letter mailed anonymously to the Beverly Hills Police Department tipping them off to the location of a “cadaver”—the body of Susan Berman, one of Durst’s alleged victims. The filmmaker asks Durst to compare the envelope’s all-caps script with the envelope of a handwritten letter he sent to Berman at her Beverly Hills residence. Durst notices the glaring similarities in the script, and acknowledges both envelopes have the city misspelled as “Beverley Hills,” but he won’t concede that he had anything to do with the murders of Berman or his ex-wife Kathleen. 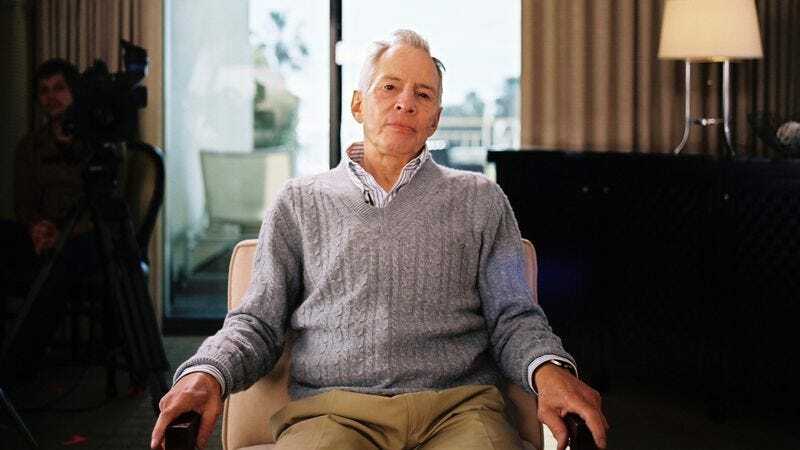 At the conclusion of the interview, Durst excuses himself to the restroom with his microphone still attached, allowing Jarecki to capture just under two minutes of Durst’s disjointed rambling and what sounds like the fragments of a confession. The Jinx’s final scene and Durst’s subsequent arrest makes the show the heir apparent of the subgenre critic Matt Zoller Seitz dubs the “slow crime procedural,” shows that serialize a single murder-mystery rather than taking on a new case with each episode. But while The Jinx resembles deliberately paced crime stories like Broadchurch, True Detective, and Top Of The Lake, its finale sets it apart from those shows by building to a conclusive finish. Slow crime shows often reveal a killer’s identity, but great care is taken to develop the characters and setting such that the show has stakes beyond the establishment of guilt. A show like American Crime technically counts as a whodunnit, but it isn’t as interested in cracking the case as it is in studying the characters left suffering in the victim’s wake. The Jinx starts out exploring similar ideas of justice unserved, loss without closure, and the relationship between perceptions and fact. But in the finale, when Jarecki is preparing to interview Durst, he says his goal is to “get justice,” foreshadowing the rug pull ahead. The Jinx is a classic whodunnit, one in which Jarecki had reach a conclusion early on. The Jinx now rests at the top of the slow crime subgenre, but it got there by completely disregarding slow crime’s guiding principles. Slow crime is a high-risk, high-reward approach to storytelling that only succeeds if the storyteller can figure out how to subvert the audience’s expectations without trying its patience. That balance has become easier to strike as more dramas have taken the slow-and-steady approach, and viewers reared on Law & Order marathons have learned the value of delayed gratification. No one was ready for the lesson in June 2011, when AMC’s The Killing ended its first season without identifying Rosie Larsen’s killer, sending its audience into fits of rage. Showrunner Veena Sud was pilloried for having cheated the audience out of a conclusion she never promised to deliver in season-one finale “Orpheus Descending.” The response to “Orpheus Descending” would be markedly different had some other show suffered the consequences of being first out of the gate. The episode was co-written by Nic Pizzolatto, who was roundly celebrated for his work on True Detective despite leaving some of its most intriguing questions open to interpretation. The radically different responses to two of Pizzolatto’s withholding scripts produced years apart demonstrates how audiences have evolved beyond murder mysteries that sprint to the finish line. Sarah Koenig’s popular true-crime podcast Serial may have benefited most from an audience re-trained to grant crime storytellers longer leashes. Koenig’s investigation into the murder of Hae Min Lee and the conviction of Adnan Syed succeeded because Koenig masterfully managed expectations and constantly reiterated that she was flying blind. In the telling of a scripted murder mystery, there’s a competitive tone to the relationship between the crafty storyteller and the audience that wants equally to be fooled and to prove it can’t be fooled. Koenig’s earthy narration as she interviewed witnesses and collected evidence made the storyteller-audience relationship cooperative and empathetic. When Koenig hit a dead end or wrangled with a question that begat even more questions, she was as exasperated as her listeners, if not more. But even for an audience that learned to relish questions without clear-cut answers, Serial’s final installment managed to disappoint its fans, offering nothing more than Koenig’s summary of her journey deep into the weeds. Serial’s success cleared a path for The Jinx, but the success of The Jinx only complicates matters for Serial as it goes into its hotly anticipated second season. Once such a story culminates in the purported confession of a suspected killer, Koenig’s well-intentioned but aimless exploration loses its luster. The Jinx also undermines scripted slow crime, which resonates with audiences because its naturalism and leisurely pace mimic the heft and high stakes of true crime with less of an emotional toll. If it’s no longer safe for Serial to raise questions it can’t answer about actual events, certainly scripted stories can’t abstain from tidy resolutions should The Jinx become slow crime’s exemplar. A conviction for Durst alters the landscape for slow crime, but if Durst walks again—which is a distinct possibility—there’s even more risk to the subgenre. Fierce debates have broken out in the legal community about the admissibility of Durst’s hot-mic moment, and while the handwriting similarities are strong evidence, it doesn’t have the impact of Durst’s own words. But even if the audio is admitted, Durst’s creepy statements may be too incoherent to rise to the level of an admission. The only court in which The Jinx can guarantee a guilty verdict is in the court of public opinion, which already declared Durst guilty years ago. Should Durst dodge conviction, The Jinx will go from success to failure, thereby highlighting slow crime’s tragic flaw. No matter how gradually a story ambles toward its conclusion, it has to get there eventually. Slow crime procedurals aim to shift the emphasis off of the big reveal, but those efforts can produce the opposite result. The shows arrive at their stopping points only after a long process of extracting maximum emotional investment from viewers and convincing them they have as much stake in the outcome as do the characters. Once the audience is that deeply entangled, any and every ending is fraught with peril and liable to disappoint. The episodic crime procedural may come across as fusty, but it only takes one bad experience with a slow crime procedural to acquit the Law & Orders of the world. Complex, long-term relationships can be deeply rewarding, but there’s a case to be made for a one-episode stand with no strings attached.